Political relations between Turkey and Korea were established on 11 August 1949 with Turkey’s recognition of the Republic of Korea as an independent country. Our participation to the Korean War with a brigade had a positive impact on our bilateral relations and thus diplomatic relations were established in March 1957. The sacrifices of the Turkish troops, who shed their blood for the freedom of Korea, are still greatly appreciated by the Korean people. This emotional connection has always sustained the Korea-Turkey friendship. Moreover, Korean people came to the aid of the Turkish people in 1999, when an earthquake devastated the northwestern region of Turkey. The close friendship between the two countries was again displayed during the 2002 World Cup in Korea. The good sportsmanship of the teams and the spectators of Korea and Turkey during the 3rd Place Match in Seoul were readily evident. The volume of the Turkish-Korean relations has begun to increase in every field in recent period. Turkish and Korean people always have friendly relations for 60 and there are not any current or potential troubles between two countries. This makes Turkey and South Korea strategic partners easily. 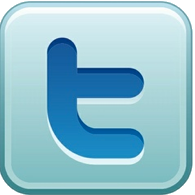 As of February 2012, 202 South Korean companies are active in Turkey. Turkey was one of the larger participants in the U.N. alliance, committing over 20.000 troops in Korean war between 1950 - 1953. The Turkish Brigade, which operated under the U.S. 25th Infantry Division, assisted in protecting the supply lines of U.N. forces which advanced towards North Korea. However, it was the Battles of Kunu-ri and Kumyanjangni that earned the Turkish Brigade a reputation and the praise of U.N. forces. Because of their heroic actions and sacrifice in these battles (721 KIA, 168 MIA, and 2111 WIA), a monument was created in Seoul in the memory of the Turkish soldiers who fought in Korea. Attached to the U.S. 25th Infantry Division the Turkish Brigade fought in several actions, and was awarded Unit Citations from Korea and the United States after fighting in the Kunuri Battle.The Turkish Brigade developed a reputation for its fighting ability, stubborn defense, commitment to mission, and bravery. Overall losses for the Turkish Brigade in Korea was 721 killed in action, 2,111 wounded and 168 missing. A total of 14,936 men served in the brigade between 1950–1953 with about 5,455 soldiers in Korea at any one time. The United Nations Memorial Cemetery in Busan, South Korea is the burial place for 462 of those casualties. Two memorials to the Turkish soldiers are at the cemetery. Ancient Turks, called GokTurks were political, economical and millitary allies with ancient Koreans, called Goguryeo. Both the GokTurks and Goguryeo did not have a specific boundary, better yet, one day you could be a GokTurk while tomorrow you could be a Goguryeo person. The ancient Chinese, Sui Dynasty built and expanded the "Great Wall of China" to distinguish themselves and to fight off the "DongYi"(aka Northern or Eastern Barbarians). The Barbarians which they regarded were us, the GokTurks and Goguryeo. The GokTurks Empire expanded West of Manchuria to all of Central Asia (significantly bigger than today's Mongolia). To the East of Manchuria, including half of present day Korean peninsula was Goguryeo. Both of these groups were very skillful in shooting arrows while superbly maneuvering on a horse. This is the traditional Altaic fighting tactic, very different from the rest of the world. The GokTurks allied with Goguryeo were fighting off the Sui Dynasty of China for hundreds of years, until a mischievous tactic by the Sui made the GokTurks to split into two groups. The Turks were driven out of their land to the West. The Sui Dynasty immediately faced rebellion by its own people because of millitary exhaustion. It gave rise to Tang Dynasty of China. Eventually, Goguryeo, without its Turkic brothers/ally, it fell to the Tang-Shilla alliance in 668AD. Burak, who grew up with the Korean War memories of his father, received the diary from him as a present shortly before he died in 2003. Burak Karakurt, who works as a lawyer, soon began to conduct research in Turkey and South Korea. Following leads from the diary, he interviewed 133 Turkish veterans of the Korean War and wrote the book “Kore’de Türk Kahramanları” (Turkish Heroes in Korea), published in 2005. Suwon was hugely affected by the war, in which many Korean children were orphaned. Turkish soldiers first put the children together in a tent at Turkish headquarters to keep them safe and healthy. Then, as the number of orphaned children surpassed 100, they reconstructed a destroyed building to use as a school and orphanage. They called it the Ankara School and Orphanage. Turkish officers and Korean teachers worked at the school. A young South Korean became the headmaster. Children were given Turkish lessons and could sing the Turkish national anthem. Classes were taught in Turkish, English and Korean. In order to keep the orphaned children as happy as possible under the circumstances of war, they were not burdened with a heavy load of homework. Music and physical education classes were given more importance. School supplies reaching Suwon from Ankara made the students happy and the teachers more effective. A piano and other musical instruments were played at the school to contribute to the psychological well-being of the children. Monthly special performances by the children made both the Turkish soldiers and children cheerful. Children looked forward to the return of the soldiers, who were father figures for them, from the front. Gen. Mehmet Nuri Yamut, the chief of general staff at the time, visited the orphanage-school in Suwon and had his picture taken with the children and teachers in front of the school. Following the cease-fire in 1953, the school remained open, but as the Turkish troops withdrew, it was closed. Then children were placed in various orphanages depending on their age. Currently, about 30 students of the Ankara School and Orphanage in Suwon are alive. Burak Karakurt, sponsored by Korean Airlines and the Society of Social and Economic Solidarity with Pacific Countries, visited South Korea twice to bring those people together. He managed to meet with seven of them who are in their late 60s and recorded their memories. They said they would like to meet the families of the Turkish soldiers who embraced them years ago. One of them is Cha Yang Cha “We were so small, only about 5 years old. The Turkish soldiers who came to Korea to fight in the war embraced us. They became our mothers and fathers. The name ‘Turkey’ fills my heart with peace,” she said. She also said she has never forgotten the days she spent at the Turkish school. In his diary, Haydar Karakurt wrote about the school along with his other war memories. 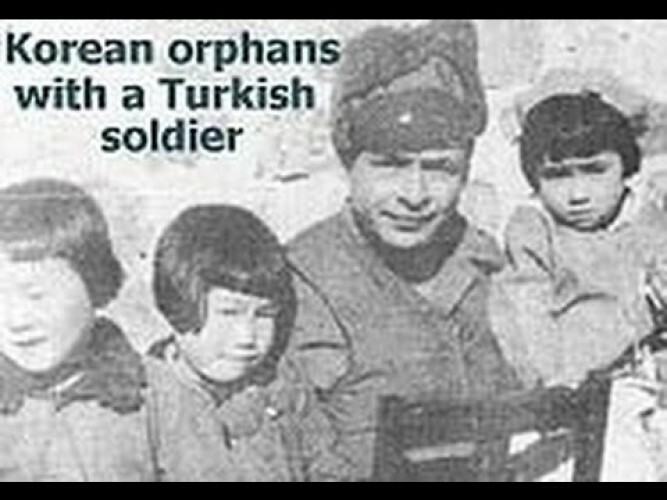 He wrote that many Turkish soldiers showed great affection toward the children, putting them in the place of their loved ones in Turkey. 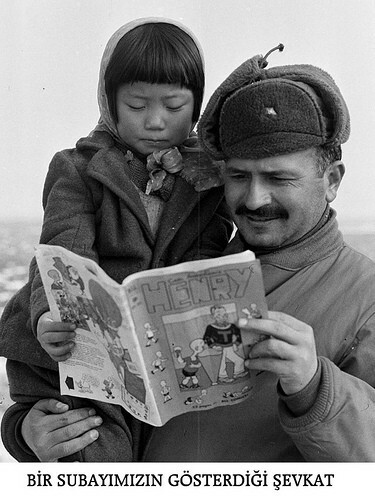 "Koreli Kızım Ayla" (Ayla, My Korean Daughter), which captured a heartfelt reunion between a Turkish veteran of the Korean War, Suleyman Birbiley, and Ayla, a child orphan of the war. Birbiley rescued Ayla from a village ravaged by bombing and cared for her as if she were his own daughter until he returned to Turkey. After the war, Süleyman Birbiley tried everything he could to get little Ayla back to Turkey to raise her as his daughter. Unable to do so, she remained behind. Finally, the duo reunited after 65 years. “I never thought a day like this would come,” Birbiley tells Ayla, moved by seeing his adopted daughter once again. While much has changed in both of their lives, the bond after all the years is clearly seen on the duo’s faces as they walk off together once again. 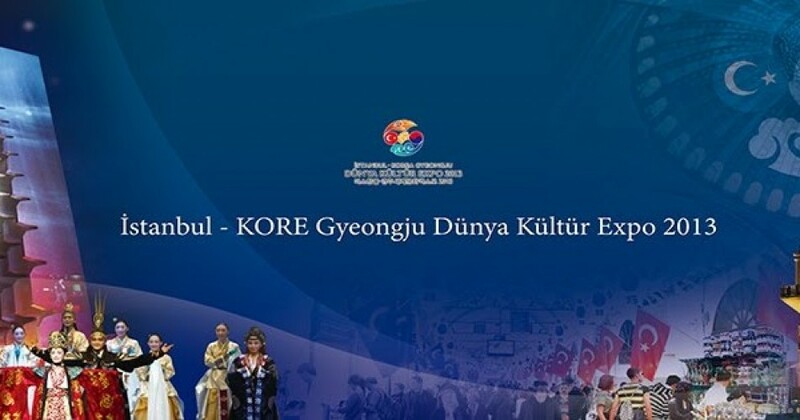 Gyeongju World Culture EXPO started from August 31, 2013 after the opening ceremony in Hagia Sophia Square to September 22, 2013 (23 days) that introduced Gyeongju culture to the world in Istanbul area. The EXPO, which is hosted by Gyeongju-si, Gyeongsangbuk-do, Istanbul City and ran by Istanbul-Gyeongju World Culture EXPO 2013 organizing committee, was an event that was sponsored by 18 institutions including Ministry of Culture and Tourism of both country, UNESCO, UNWTO, etc., and about 40 countries. Since it was held in Turkey, the brother country, the event was various and meaningful. Mayor of Gyeongju participated in 'appreciation ceremony for veterans of Korean War' at ICEC Convention and appreciated the veterans for their sacrifice by stating "I heard that Turks were the bravest force during Korean War." At the 'Photo Exhibition of Representative Photographers of Korea' that shows the beautiful scenery of Korea through the picture, representative photographers of Korea including Kim Jungman gathered together and showed the beauty of Korea by displaying about 180 works about soul of Korea and spirit and cultural heritages of Gyeongju, the millenary capital of Silla, which are interacted in modern viewpoint. As a part of 'Korea Silk Road Project,' ceremony unveiling the monument for Silk Road friendly cooperation was held on September 1. Monument for Silk Road friendly cooperation is a symbolic object for the establishment of cooperation system with Silk Road hub nations, and monuments are installed in China, Uzbekistan, Iran, Turkey, Gyeongju and other hub nations of Silk Road which is about 17,000km. Mayor of Gyeongju unveiled Silk Road monument while visiting Isfahan, Iran. Lastly, the monument was installed at Gyeongju EXPO Park on November 4..
Mayor of Gyeongju showed the expectation by stating, "I could feel the great interest in Gyeongju including Korean traditional music, hanbok (Korean traditional clothes), cultural heritage and traditional culture through this Istanbul-Gyeongju World Culture EXPO while pop culture of Korea such as singers, songs, dramas received the attention so far," and "I am expecting the visitation of Turkish tourists to Gyeongju from this Fall due to the great interest in Silla culture which is a representative of Korean culture, and this EXPO will contribute to the introduction of Gyeongju to Turkey and other European cities, as well as taking off to the international city." 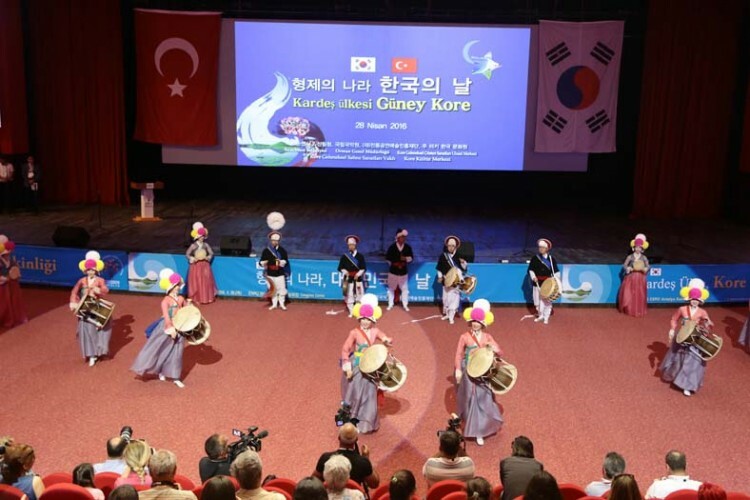 A continuation of the Istanbul-Gyeongju World Culture Expo 2013, which was based on the slogan, “Starting a new journey”, Istanbul in Korea 2014 aimed to forge cultural ties between Turkey and South Korea. 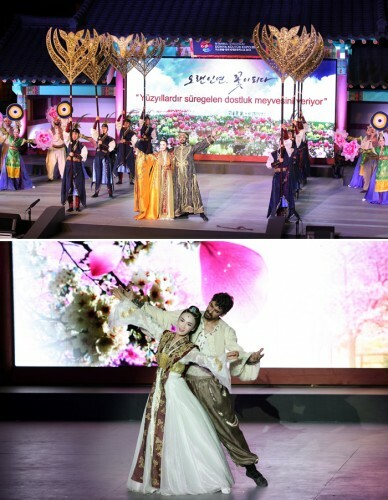 The culture, traditional and modern arts, music, folklore, literature, film, and theater and performance arts of “cradle of civilizations” Istanbul were promoted at the 10-day event. 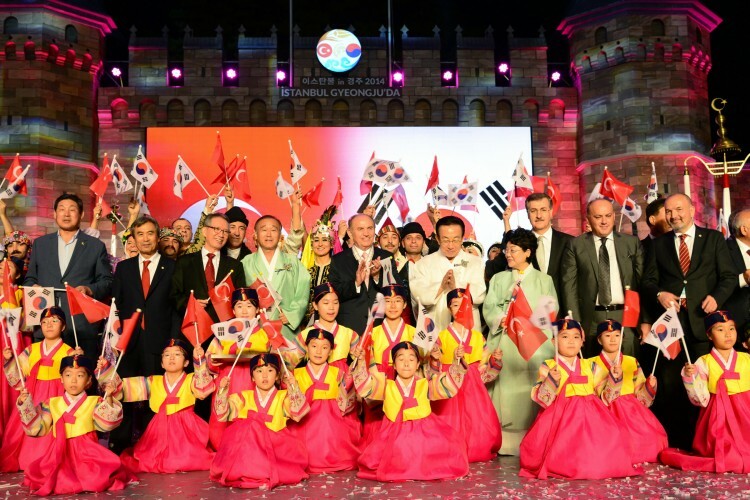 The 10-day "Istanbul in Gyeongju 2014" kicked off September 12 with Topbas's visit to North Gyeongsang Province, following last year's reverse exchange at the Istanbul-Gyeongju World Culture Expo on Turkish soil. At the opening ceremony, the Mehter Bölüğü military band, the oldest military band in the world, overwhelmed the entire audience with its magnificent performance.Following it, the traditional show “the Love of Anatolia” that expresses the history, culture, and generosity of “Anatolia” – the Turkish territory on the Asian side – colored the night of Shilla that the moon was shining brightly over with the Turkish gestures and melody. Booths were set up to promote the Turkish city’s history, art and food. The re-creation of Istanbul’s Grand Bazaar in Gyeongju was also representative of very real possibilities for enhanced business exchange, with a trade show and a job fair being held on the sidelines of the main event. Defense attaché Colonel Joosenog Han, whose commission at the Korean Embassy in Ankara expired, has visited Turkish veterans of the South Korea War and bid farewell to them before leaving for his country. The visit which was quite emotional for both sides, took place at the Turkish War Veterans Association at the northern province of Karabük on Tuesday. The colonel was accompanied by his wife, and as he entered the association, he started kissing the hands of the elderly veterans, which is a traditional gesture in the Turkish culture to signify respect for people significantly older than one's self. "I have been looking at this picture [of the deceased Turkish veteran] for the last two years. I have decided that I should show my respect to them by visiting them. This is why I have been going around Turkish villages during the last years [to see veterans]. I have even driven up to seven hours to see even one person in villages." Before going back to his home country, the attaché wanted to pay a visit to the cemetery of the deceased Turkish veteran Necati Dalgıç whom he never had a chance to meet and had been keeping his photograph in his wallet. Han also gave the veterans of the association a gift sculpture of a Turkish soldier. The chairperson of the Karabük branch, Sebahattin Çorbacı also made comments to the reporter saying, "How happy are the veterans and Turkish soldiers, if people come all the way from Korea and visit our veterans' cemeteries." "The Korean people, soldiers and attaches have always welcomed and appreciated Turkish soldiers, and keep doing so." After his visit to the Association, Han then went to Necati Dalgıç's cemetery, where he poured water on the grave, which is a custom in Turkey, and prayed. The colonel then stood in homage to the deceased veteran by the grave, along with other veterans from the association. On 13 October 2006, he was elected to be the eighth Secretary-General by the United Nations General Assembly. On 1 January 2007, he succeeded Kofi Annan. He was named the world's 32nd most powerful person by the Forbes list of The World's Most Powerful People in 2013, the highest among South Koreans. António Guterres was appointed by the General Assembly on 13 October 2016 to be the successor of Ban Ki-moon once he steps down on 31 December 2016. UN Secretary General Ban Ki-moon has been to Turkey numerous times. 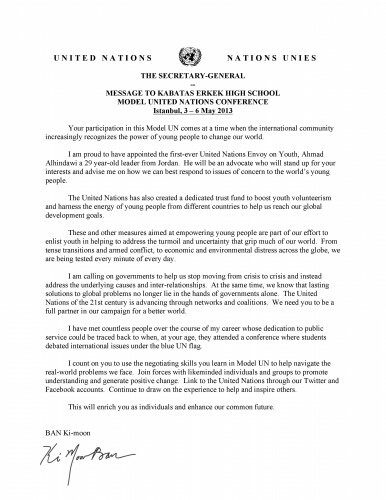 He sent the letter below to Kabatas High School Model United Nations in 2013. “…If I may speak more personally for a moment, I would like to remind you that we Koreans have a special tie with Turkey. Sixty years ago, you were among the first to answer the call of the United Nations. More than 5,000 Turkish troops fought in the Korean War. You call them “Koreli.” Nearly 500 lie in the world's only UN cemetery, in Busan. Most of you are too young to remember those events. Yet perhaps you remember the World Cup, 8 years ago, when Turkey and the Republic of Korea played for third place. It was a close game; Turkey won. But you were reluctant victors, it seemed. At the end of the game, players on both teams joined hands to wave the flags of our two countries. 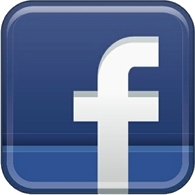 The mystic must love all 72 nations.” At the United Nations, today, we have 192 Member States. But that poem could be our credo. The United Nations is founded on the most noble ideals. I thank Turkey for its strong support, and I thank each of you. Today, the scale of human suffering is greater than at any time since the Second World War. More than 130 million people around the world need humanitarian assistance in order to survive. 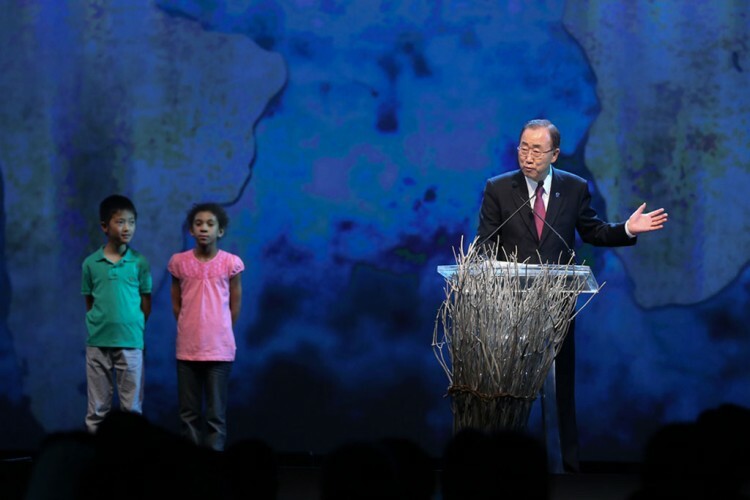 This is why, for the first time in the 70-year history of the United Nations, UN Secretory-General Ban Ki-moon convened the World Humanitarian Summit to generate commitments to reduce suffering and deliver better for people around the globe. A GORYEO PERIOD SONG "GREEN MOUNTAIN" or "SONG OF CHUNGSAN"
“Green Mountain” is a Korean period song originated from Goryeo Dynasty. It expresses one’s desire to live in peace and serenity cut off from the ordeals of the mundane world. 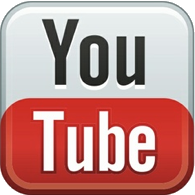 VIDEOS ABOUT KOREA ARE AVAILABLE ON THE VIDEO SECTION OF THE WEBSITE.